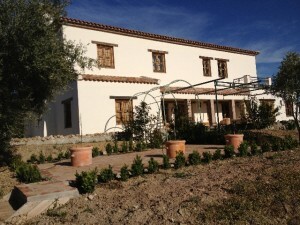 Description This is the most beautiful property accessed via it´s own private driveway on a hilltop amidst the most fantastic surroundings and with panoramic views to the mountains. This property is just a 10 minute drive from the lovely village of Riogordo and is 30 minutes from the coast and 45 minutes from Malaga and the Airport. The house is extremely spacious with large rooms and stunning views from every aspect. The property was designed by its current owners and has been fitted out and finished to the highest of standards. A well known Dutch Carpenter has individually designed all doors and fixtures in top quality oak and the stairway, banisters and filiols are handmade in oak and with reclaimed antique fittings. The house comprises on the ground floor - large open plan fully fitted kitchen/dining area, utility room, sitting room with open fireplace, spacious rear entrance lobby with guest cloakroom with the most modern fittings, reception areas and a large study/Bedroom 5. The oak stairway leads to a galleried landing with four spacious and fully fitted double bedrooms, the master bedroom has a lovely private terrace with fantastic views, there are 2 ensuite bathrooms and a separate family bathroom. All fixtures and fittings are in high grade marble and the bedrooms are fully fitted with wardrobes and cupboards.. This is truly the most exclusive property. There is underfloor heating throughout plus additional radiators, full double glazing, Airconditioning, broadband internet and satelite TV - Infact this property has everything. There is a solar water heating system as well as emmersion tanks. To the exterior is a large 12 x 5 mtr pool with immaculate surround terraces, beautiful fully irregated gardens with structural covered terraces, storage sheds and workshop areas. There are 20000 litre back up domestic water tanks and independent storage tanks for the garden irregation system. This exclusive property will make a lovely family home or holiday retreat with something special. Viewing is highly recommended.